Is to connect students with GAIA philosophy and learn about stewardship and universal values and how their wholistic attitudes can ensure sustainability. Students undertake experiential activities and critical thinking to explore values and to understand the importance of balance. The workshop provides some data on the diversity of species and extinction rates. The workshop will inform students about the ecological footprint, human population and materialism. The outcome of the workshop will enhance a deeper appreciation of human connection to the natural systems and how finding harmony within through values can provide a prism for solving problems in the external world. Harmony or peace with nature reflects inner peace. As humans take responsibility and feel their interconnectedness with the natural system through their values they will naturally pre-serve the planet. The workshop focuses on what is peace and the connection to our true nature. Participants are encouraged to connect to their inner peace and connect with others by smiling, tap on the back and then return to exploring how they feel within. Peace is explored as love and the connections made to materialism as a compensation for love. The workshop looks at fear and personal inquiry to question beliefs. Part 2 of the workshop looks at nature connecting to nature through art, artifacts, the body and awareness. Participants are encouraged to imagine they are nature and sensitising to blocks and flows. They are introduced more to negative and positve thoughts as toxic and unifying and how words change material reality. They go through a process of deeply listening, this of course was the wisdom of the Australian indigenous, not only listening to the spoken word, but listening to ourselves and the life force. 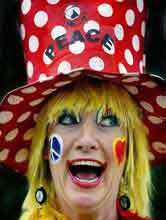 The last focus of the workshop is to look at clowning and happiness, to feel happiness as a natural flow. The outcome of the workshop is to gain a deeper understanding of peace as our true nature and the importance of inner harmony and outer harmony. To understand that love is not an etheral concept but very integral to how we treat ourselves, others and nature. Participants will learn about fear and truthful self inquiry. They will connect with nature through art, artifacts, mimicking and sensitising to their own bodies as nature and feeling the flow of nature here and now. They will become aware of how our thoughts create either unity or toxic outcomes and to become aware of deeply listening to our nature. Copyright © 2019. worldpeacefull.com All Rights Reserved.